Karaoke is a very different experience in the Western hemisphere to what it is in Asia. For some reason, we decided singing in front of total strangers was the best way to do it, which is ludicrous. This is almost never done in Asia – there, karaoke involves renting a small booth with just your friends, or even alone! You’ll sing at least ten songs, often aided by all-you-can-drink beer and alco-pops. It’s that which experience I’ve tried to replicate back home in the UK. You can find a few bars like that in Chinatown, but the overpriced nature of anything in London makes them prohibitively expensive. Why not just buy an authentic karaoke player, I thought? So that’s what I did. The Lemon KTV Karaoke player (KHP-8836) is available direct from China for around $350 plus shipping or from Amazon for $349.99 with free shipping, complete with a selection of English and Chinese songs loaded on a 1TB hard drive (there are options for Japanese and Vietnamese songs too). A barebones unit can also be purchased without a drive or songs for $190 from Aliexpress or Amazon for $199 (which is the model we’re giving away). There are no competing consumer-level products that also come with an English interface. There are karaoke apps for Xbox Live and Wii U, but these are overpriced and dismally short on songs. The box is huge – I fear we may have accidentally purchased a video-cassette recorder. The box indicates it’s a “VOD Karaoke Player” but I’m not sure if that’s supposed to be a brand name or some obscure file format. No microphones are supplied, but any standard mic with phono plugs can be used. Each mic has an input level control, and there’s built-in echo. There’s even a plug for a coin controller, but I don’t suggest you try renting the karaoke player or you’ll open up a whole can of licensing worms. Before adding your own drive, format it using a PC and copy over the demo songs on the supplied CD. There are 6 screws in total to remove before the case slips easily off, revealing a spacious interior. Inside the guts of this player is a custom ARM A9 single-core 1GHz processor with 1GB of RAM – basically, it’s a low end Android TV stick in a large case, and a built-in audio mixer / amplifier for microphones. Around the rear is a whole host of connections as you’d expect from an AV unit. As well as HDMI, component and composite video, there’s optical and composite (RCA) audio connections. Note that although Android itself can output system sounds over HDMI, the Karaoke application which you’ll be using requires that you also plug in RCA stereo cables to your sound system or AV receiver – audio will not be transmitted over HDMI. A WiFi antenna is also provided should you wish to connect to a wireless connection, but if you’re looking to also stream videos over the network (not karaoke videos, those must be stored locally), I’d encourage you to hook up the ethernet instead. A standard SD card slot is provided for use with Android, and two full size USB ports for connecting external storage. A mini-USB port enables you to access the internal drive from a PC, so that you can update song lists and copy videos across. The supplied remote is a little disappointing – unlike the “air” remote that I used in my review of two Android mini PCs Rikomagic MK802 IV and MK812A RK3188 Android Smart Mini PC Review and Giveaway Rikomagic MK802 IV and MK812A RK3188 Android Smart Mini PC Review and Giveaway A complete Android system for your TV - not a Chromecast, not an adapter for your phone – no additional hardware required. Android "TV sticks" are mini computers running Android. They have no screen, instead... Read More the Lemon KTV remote requires holding down the left key to move the cursor left – there’s no gesture support at all. Navigating in mouse mode then is painfully slow – however you can switch out of mouse mode simply enough and select options with the arrow keys. I’d strongly suggest getting a Bluetooth keyboard The 10 Best Wireless All-in-One Keyboards for Mac and PC The 10 Best Wireless All-in-One Keyboards for Mac and PC Wireless all-in-one keyboards can turn any boring computer into an exciting home theater PC. Which one should you buy? Read More for this though, especially if you’re not connecting the karaoke player to a phone for selecting songs. Speaking of which, there are iOS and Android apps which are by far, the preferred method of selecting songs. It’s pretty straightforward to set up – just set the IP address of your player (you can find that in the main menu, under network connection) and connect. You will need to update the song list data first, which can take quite a while, so sit patiently while that completes. Once it’s done, hit the log in button to launch the karaoke song menu and access the same interface. Although the interface is available in English, the system is designed for use in Asia which often means song selections from a number of international countries – as such, there’s an option to browse by language. There no setup procedure on first boot, so you’re thrown straight into a basic Android home screen. The Android button opens up the apps menu, including pre-installed copies of PPTV and XBMC. The base system running here is Android 4.0.4, and that’s unlikely to be upgradeable. Also on the home screen are quick shortcuts for music and video players, photo viewer, an Internet browser, and of course, the Karaoke application. You can access the Google Play store as usual. The process of adding songs is certainly not as easy as I was hoping – using the supplied software is recommended as you’ll need to format the song list file in a very specific way. Disappointingly, it won’t automatically extrapolate the song name and artist from the file name, and you can’t simply select a file directly – it must be added to the archaic catalogue via an entirely unfriendly spreadsheet interface. This involves renaming the file with a number, then adding information about the song to the existing Songlist.txt file, such as artist name and language code. There’s also some obscure fields for “word count” and “song spelling” – this is for Kanji-based languages where there are multiple spellings of the same characters, and people will search for music according to the total number of characters in the title. It does seem to work with a variety of video formats, such as AVI and MPG, or MP4 clips which you’ll get from YouTube – no conversion is necessary. I persevered with some songs I’d downloaded from YouTube – you’d be surprised how many karaoke songs you can find for free there. The easier option is to buy a hard drive pre-populated with a few terabytes of songs in your language of choice – these costs about $100 each from the same supplier. However, due to legally grey nature of these, we can’t supply one of these to the winner – you’ll get a barebones (diskless) karaoke device, to which you can add your own hard drive. Upon launching the karaoke app, it jumps straight into a random music video selected from the non-Karaoke directory; these are just “defaults” to get the mood going, so you can add a selection of YouTube videos of whatever the latest hits are. It takes a short while to load the song database. Although there are mic echo and volume controls, the software doesn’t automatically reduce the existing vocals – so the quality of your karaoke experience is mainly going to depend on the songs you put on it. You can enable a score at the end of each song which supposedly judges your singing quality, though having tried it with the microphones unplugged and scoring 71%, I’d hesitate to call it anything other than a random number function. Then again, my actual performances also garnered a couple of 100% scores, so it must be legit. In terms of technical specs, the system runs on an MBX “reference board”, with 1GB of RAM and a single core 1GHz CPU, using a Mali-400 MP graphics renderer. Antutu reports appalling low score of around 3900 – seemingly as low as the ranking goes down to. General Android system performance reflects this and is accordingly frustrating. It’s capable of streaming movies through PPTV, XBMC or Plex, but otherwise don’t expect anything stunning or to be playing the latest 3D games. This is first and foremost a karaoke system running Android – not an Android with karaoke features. Should You Buy The Android Lemon KTV Karaoke Player? For an authentic karaoke experience – or if you’re having trouble finding Asian songs in country of residence – definitely pick one up. Adding songs is a bother, but not something you’ll do often. The Android system is slow and unwieldy, but use the mobile apps to pick songs and you’ll belting one out in no time. How do I win the Android Lemon KTV Karaoke Player? Congratulations, Jody Richardson! You would have received an email from jackson@makeuseof.com. Please respond before March 16 to claim your prize. Enquires beyond this date will not be entertained. Explore more about: Karaoke, MakeUseOf Giveaway. I think the latest version is the KTV-9000UHD. yo tengo un karaoke, de este modelo se descompuso, asi que quisiera saber si ustedes me pueden ayudar para arreglarlo o bien si me pueden dar el precio para comprarlo nuevamente. Quisiera saber si ustedes pueden arreglar, mi karaoke se descompuso o bien decirme el costo y donde podría comprarlo. Does anyone test the 2 front MIC inputs? I tested out the GTDAudio UHF wireless mic on two different Lemon KTV 8866. No sound comes out from MIC. It looks like the 2-MIC do not work at all. Do i need a mixer or amplifier? Of course they work, otherwise it would be a fairly useless karaoke machine. Have you tried with cabled mics so you know your wireless hardware isn't a problem? You're using the supplied karaoke software, right? I don't think they'll work with standard Android apps, you'll need to use the specific KTV software which hooks into the built-in amplifier board. I tried to test Lemon KTV 8866 both wired and wireless MIC input, but it doesn't work. It something wrong. this karaoke player is just ok. once in a while it frozen I have to shut it down and restart the player. mine can stream the video and audio via HMDI to the TV but no sound or audio via AV cable. I tried to find any kind of set up from the unit for the output but I could not. karaoke apps works good with iPad but crashed badly with iphone (frozen and disconnected from the network). some songs disappear from the song list via the apps even they are still there in the HD. many songs are duplicated as the original one and many are also duplicated with a different name with the same content. number of songs shown by the karaoke player actually represents the number of karaoke files. Note: all original songs are encrypted. I noticed you were doing Japanese. I live in Japan and was thinking of ordering this for home/school karaoke. Does it require internet connection to operate (like the professional grade units such as DAM Karaoke)? Does it have a decent selection of English songs? If you live in Japan, can you tell me if Japan adds a hefty import tax to this? Hi Marcus, I bought this when I moved away from Japan. Honestly, Karaoke is so cheap in Japan with all-you-can-drink beer that I don't think I'd bother buying a karaoke machine if I were still there. There were no import taxes, since Chinese companies lie about value on the boxes and label it as a gift. When you buy, you choose the song languages, so we bought the one full of English and Chinese songs. The Japanese ones are just songs we downloaded from Youtube and added ourselves, but you could just as easily choose the Japanese song archive. No internet required, though the mobile apps require a local network connection to the unit, of course. I think my reply was accidentally deleted so I'm going to try this again. My apologies if the reply shows up multiple times. Thanks for your quick response. I was looking at this and Songtrix. I'm wondering if it would be possible to add some custom functions to this. For example, would it be possible to add autotune, vibrato, or 4 part harmony to the functionality of the karaoke system? Is it possible to change the key and tempo? After all, I think there are android apps that enable this, but could they work along side of the karaoke app already installed in the device? One other quick question. The song list has 13,000 English songs. As I look through it though, it appears like the each song is listed 2 or more times (using the band name, the artist name, and maybe a 3rd name). Makes me wonder if there are really only 4,000 songs or so. I have no desire to count. Not a big deal since Youtube is here to save the day. Just raises questions about truth in advertising (and what else to expect). Also, since there is a larger hard drive claiming to have a larger English library of songs, I wonder if it really has more songs or if they just have even more copies of each song. I'm willing to pay more if I'm getting more. Otherwise... Youtube is my friend. There are lots of duplicates on mine, but not all songs. Song have maybe 15 copies though - all unique karaoke versions, rather than exact duplicates. The larger hard drive will definitely have more songs, not just duplicates (but will also have duplicates of itself). LemonKTV doesn't do anything like autotune, and I don't think those apps will work with it - I don't think it uses the standard Android sound subssystem, but I could be wrong. There is a new model KHP-8866 which has the option for add song from cloud. Are you familiar with this new feature? Do you know how to get it work for KHP-8836? It has support for add songs via the cloud. I am curious as to how this is done. How did you get it connected to WiFi? I am unable to put in my WiFi password which has letters with the remote control. Tried to connect a USB keyboard to the back but the device doesn't recognize it. Is there another way to connect a keyboard or to input letters for the WiFi password? It's just Android - a virtual keyboard should pop up. I'm afraid I'm no Android expert though, so if the virtual keyboard doesnt appear, might be a setting somewhere. May also not appear if it thinks an actual keyboard is plugged in? Oh really? It'll automatically identify the song from the video and add all the relevant metadata, will it? Hi, I ordered the KTV-8836 but the installation dvd was damaged during shipping. Can I get a copy of the installation CD from you? How do you add songs to favorite list from either the app or remote control? Press *Favorite* on the remote control. I bought one of these. Lemon indeed, don't waste your money. Neither the iPhone or android remotes work (tried both), which leaves you with the clunky and slow android interface, to select songs. There is no support, and after two emails they just stop talking to you. If you are asian, get a well known asian brand (airang for Vietnamese is well known, and pretty good), i think they survive off dumb shmucks ponying up the $$ to get a substandard device, and not knowing any better, or being able to get support or a refund. It's a shame, as it has potential if it worked, and was even a little supported, or open source, so the community could support it. I'm sorry you've had a worse experience with this. Mine's still working fine - we select songs from many different mobile devices. Not perfect by any means, but it certainly works and is still one of the best options out there. Sometime later (maybe 6 months ago) they updated the apple app for the newer IOS version and it works OK now. It's not a bad device really, but it comes down to song selections, rather than technology. It has merit just being an android device, which you can add software to. We shifted to another brand of device to get the well known / more familiar vietnamese songs. Just wonder how you are happy selecting "songs from many different mobile devices". Maybe you have an older version? Please have a look at the 188 comments for the app Lemon KTV on Google Play. Many, many complain about the clumsy, ineffective app. Many times the search returns zero songs, although the songs do exist on the hard disk. I have the same problem. Maybe we don't know how to search properly? Can you help? Lemon KTV of Insound Technology should develop a good mobile app to select songs like the YS-HDMK (YouSing HD). YS HDMK probably buys karaoke hardware from a Chinese manufacturer, even maybe from Insound Technology. But due to their good mobile app they are selling better, I guess. It's a shame that Lemon KTV doesn't listen to its users to improve its business. This is probably a silly question, but have you updated the songlist? After logging in, you need to hit the "Update data" button, then update songlist. It takes a good while to sync up the list of songs to your mobile device, otherwise they won't be found. To be fair, using karaoke HD machine is not for every one..
1-customer service? there is no customer service at all, period. i am a very small re-seller to my Vietnamese relatives and friends, i collet and adjust music + make karaokes just because i like it not because of profit; i have to spend great amount of times for the service after sell, so 1 machine fails-i lose big money. *they also need to have some one understand Vietnamese with them. Western, for no other reason (I believe) than it is more familiar. Haven't done Karoake in easily 10 years, but remember some of the more interesting singers in public Karoake Bars like it was yesterday. Western. Mainly because I can't read or understand chinese , Japanese or Korean. I'm assuming in the Asian version, songs would not be in english. I have no karaoke experience. I prefer western style karaoke because it gives me more fun. I'd prefer the western style. I have no karaoke experience what-so-ever. I would prefer Western, only because I never experience Asian. I've never experienced Asian karaoke, so my favorite would have to be Western. Asian. They have huge variety of songs. Both. I went Karaoke last week. Western might be better for a mix group because everybody is more familiar with some of the songs like Adele or Katy Perry. I didn't know there was a difference! So after reading the comments I would choose Asian. Either, depends what I feel like singing. Last experience was a little norebang place in South Korea. I prefer Western. I also love Asian, I enjoying singing with my officemates. Western karaoke! But asian karaoke can be hilarious too. Thanks for this chance! love to try both though only used western so far. The Western Karaoke is Awesome. When I think of the word Western,I think of freedom,like horse back riding,western guitars,western cowboy shirts,western boots,western coats etc. All this is freedom to me and to do what I like to do that makes me feel happy,and to sing using this Awesome Kareaoke machine would add to my freedom of experience,it would be an experience I know I would really enjoy and to be able to share the experience with my family and friends when they come over. I have found them both to be either really good or really bad. Most of my experience, including my most recent has been with an Asian karaoke machine, which did work very well. Western! thanks for the chance! Never listened to Asian music so its Western for me, this looks like a brill bit of kit hoping for a win. I prefer Western style because it respects my style of music. Last time I sang a song on a karaoke was two weeks ago at a party and I've enjoyed myself a lot! Asian Karaoke of course, because I used to adopt and love the style of it and it's a cultural thing here in PH. But I want to try also the western karaoke to experience something different. ? Asian because of the people behaviour with you. Asian because people act normal around their friends. Western because it is easier and more enjoyable for me. I prefer Western,because that is the style I am currently using. Western. It's what I know. Asian because I'm more familiar to Asian songs! Asian for me. Brings back good memories of doing karaoke in Tokyo. Asian because of the nicer music videos and the fancier menu system. By the way, your site is more or less unavaileble today. Almost none of the links for Gmail+ and several other links for earning points was acsessable! My teenagers love k pop and j pop so I would say Asian. I have never owned or try Karaoke but would sure love to own one! I think western would be more familiar! Thank you I love all the contest you have!! I like the western karaoke. We love singing!!! Even the songs don't loves us!!! I prefer Asian karaoke b/c I believe they invented it and know how to do it right. I prefer Asian, because there many good review's about it. I have never done karaoke before. I dont know the difference between the 2 styles..I just like to sing even though I am terrible! Asian because private room is the best. I'd have to say Western, as that's the only one I'm familiar with. Western. Because it's the only one I've tried before. Western cause it's the only type I'm familiar with. I prefer Asian styles, as I'm an Asian. Western! I don't know any Asian languages, nor am I a fan of Asian music. Asian because that is where it originates from. Don't change a good thing! I much prefer the Western style of Karaoke. I much prefer singing in front of drunk strangers that I'll never see again. I like Western style karaoke because it is easier to sing. The last time I sang karaoke was with my family during Christmas holidays! Western because I have no choice. I suppose my preference depends upon my mood. If one wishes to drink and sing sad songs, then Asian (small room) Karaoke is perfect. If you venting before whoever will listen, then Western Karaoke is the ticket. Most often, I like to sing well, and be a little silly, in front of a crowd. Western Karaoke! I would prefer Asian Karaoke !! I prefer the Western style because it is easy to copy and memorize. I've never done the Asian style karaoke. I do it Cuban style! With back up singers and everybody dancing! Asian! Private rooms and tasty snacks and drinks! suppose this might be fun provided I could get this all tweaked out to actually work!! Western -- I don't know any other language but English. Asians invented Karaoke I think. As someone just sitting and observing, American is much more entertaining. As the person singing, definitely Asian style karaoke (within a private room with drinks and snacks). Western…it’s the only kind I’ve ever seen. Western, cause I am new to Karaoke. Is there a difference? We sang at a party. It was OK. I prefer Western, because I sing semi-professionally anyway, and that gives me a chance to work on my crowd skills. Asian pop is the best especially Kpop. Very catchy and easy to sing along to. Western pop is great but their bread and butter these days seem to be r&b and hip hop. Being Asian, I have to say we have awesome Karaoke. Kpop, Jpop, Cpop, etc., very easy music to follow along and sing to. Western pop ain't too shabby as well. Western. I am new to Karaoke. I dont' but my my 2 youngest have been bugging me for a kareoke machince for years so they would just flip for this . And they sing everything from hip hop to heavy metal!!! Thanks for the chance to win this!!!!!!!!!!!!! Western. No experience with the "Asian" version. Western...it's the only kind I've ever seen. Western because I'm English and I have never tried karaoke. 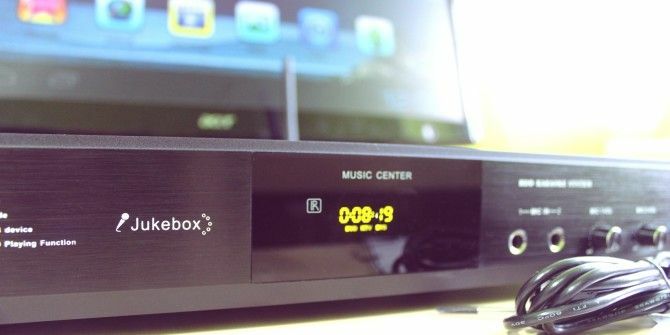 I would like to try this with XBMC and some of the other functions. English, of course since it is what I speak and would sing to. Western. I forget all my karaoke experiences on purpose. Western, cause I like to do it casually, sometimes with my friends but renting is too much.